Presented by Art In City Hall, Office of Arts, Culture and the Creative Economy In partnership with An Open Window, a nonprofit project partner of the Center for Transformative Action affiliated with Cornell University. Philadelphia, PA – Philadelphia’s Art In City Hall program – part of the City’s Office of Arts, Culture and the Creative Economy (OACCE) presents Without the Wall, an art installation curated by Treacy Ziegler. The exhibit runs from June 25th – August 22nd, City Hall 2nd Floor, NE corner near the offices of the Mayor. Without the Wall is an anonymous presentation of approximately 55 incarcerated and non-incarcerated artists, many of whom are from the Philadelphia region. The installation asks the viewer to experience the art without knowing whether the art is created by prison inmates or professional artists on the outside. The artists were asked to create a work of art in the format of a 6-inch circle. Each piece is framed in a black square and suspended from the ceiling. Because the work is suspended from the ceiling, both sides of the black squares are visible. The backs of the squares are covered with artwork and letters that are sent to Ziegler from prisoners who participate in her through-the-mail curriculum that she has established with 2300 prisoners throughout the United States in her project, An Open Window. Her intention isn’t to use art as a form of therapy or rehab for prisoners. It’s about the art itself and whether as viewer’s we can experience art without filters or preconceived notions about the work based on the people who’ve created it. Without the Wall is part of An Open Window, a project partner of the Center for Transformative Action affiliated with Cornell University. The mission of the project is implemented through both exhibiting outside professional artwork in prisons and through conducting workshops with inmates. Treacy Ziegler is an exhibiting artist and over the past 20 years has had about 30 exhibitions in major galleries in New York City, Boston, Philadelphia, Toronto, Alexandria, VA. and Corning, NY. She is a graduate of Pennsylvania Academy of Fine Arts. Prior to attending art school, Treacy received a Master of Social Work from the University of Pennsylvania. At that time, she worked as a family therapist and social worker primarily in the housing projects of Philadelphia. In An Open Window project she brings both her skills and vision as a working artist with her social work experience to develop a complex understanding of both art and the viewer’s relationship to that art. 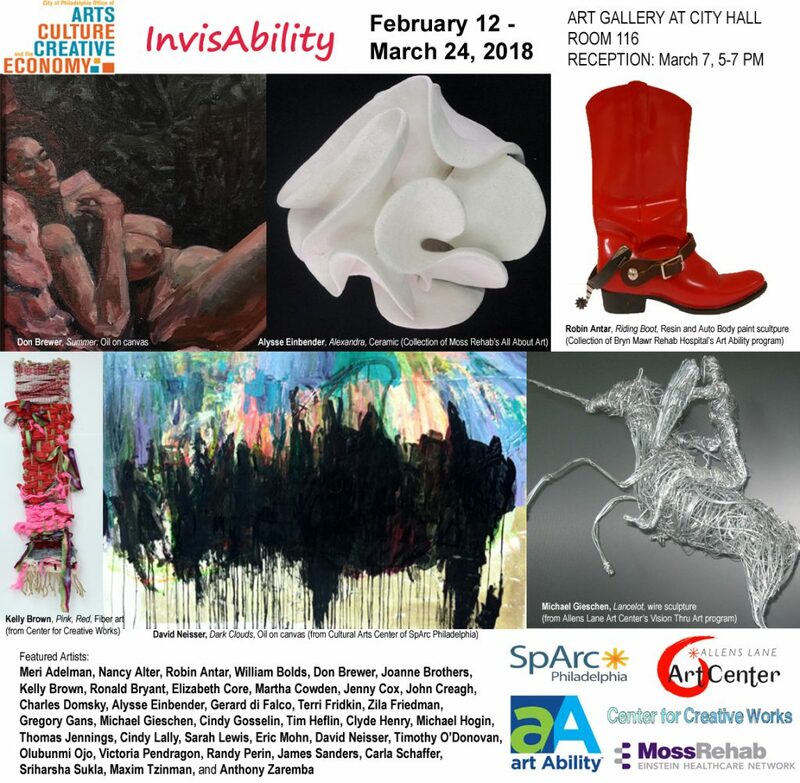 Art In City Hall presents exhibitions that showcase contemporary artwork by emerging and professional visual artists from the Philadelphia region. Encompassing a variety of mediums, techniques, and subjects, this municipal program is committed to presenting a diversity of ideas and artistic explorations. The program strives to link visual artists with the larger community by providing the public with a greater knowledge and appreciation of their artistic achievements. The exhibitions at City Hall are supported by an independent Exhibitions Advisory Committee made up of local arts professionals. This entry was posted in Art, Art Galleries, Art in Philadelphia, Art in Philadelphia City Hall, Art Spaces Philadelphia, Culture and the Creative Economy, Fine Art Philadelphia, Installation, Mixed Media Art, Office of Arts, Philadelphia, Philadelphia Art, Philadelphia Art Galleries, Philadelphia Art Installations, Philadelphia Art Shows, Philadelphia Artists, Philadelphia Artists, Public Art, Self Taught Artist, Uncategorized and tagged Art, Art in City Hall, Art Installation, Art News Blog, DoNArTNeWs, mixed media art, Philadelphia, Philadelphia Art, Philadelphia Art Gallery, Philadelphia Art Shows, Philadelphia Artist, Philadelphia Fine Art, Treacy Ziegler, Without the Wall on June 24, 2014 by admin1.